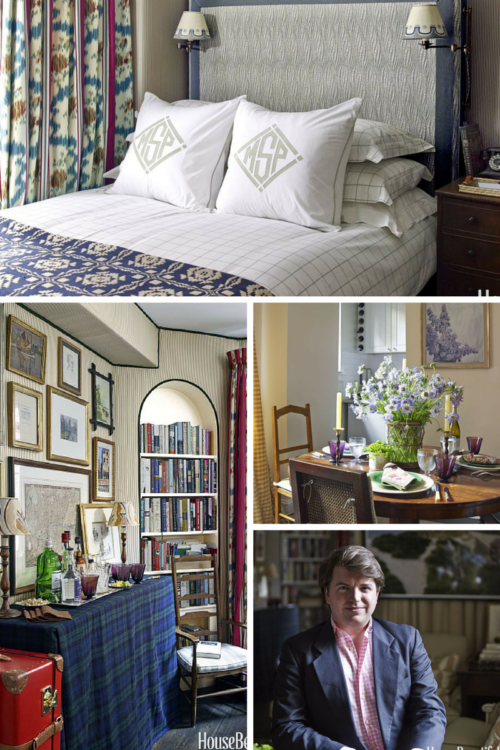 This month’s House Beautiful features the Manhattan studio apartment of designer Max Sinsteden; with just 525 square feet Max utilizes every inch! We reached out to Max to find out his must haves for the bedroom and entertaining - his bar just so happens to be in his bedroom! Designing within a small space you were limited on what you could include in your bedroom. When it comes to designing a master bedroom what are your must haves? (MS) I'm chuckling to myself that you call it a Master Bedroom! I really like to sleep in almost absolute darkness otherwise no matter how tired I am, I wake quite early. So heavily interlined curtains and a way to make that space feel completely separated was a priority for me. Having slept in twin beds for almost the entirety of my life--all my previous apartments I had a twin, my childhood bedroom (even a little re-decorated) still had a twin and all those years in boarding school & college dorm rooms--so I got to order my own 'adult' bed. The most comfortable mattress and box spring from Beckley and some new sheets. We just love the bar set up in your bedroom! What are your entertaining necessities? (MS) In terms of entertaining, I prefer to have people for drinks and have hors d'ouerves and then walk around the corner somewhere local for dinner. Takes the pressure on cooking a whole meal--in a kitchen smaller than a standard closet--but still allows to entertain at home. A stocked bar, some yummy nibbles and piles of linen cocktail napkins--I have so many varieties from simple and subdued to elaborate and amusing.